Out this week, part of a veritable torrent of new releases (talk about feast or famine! 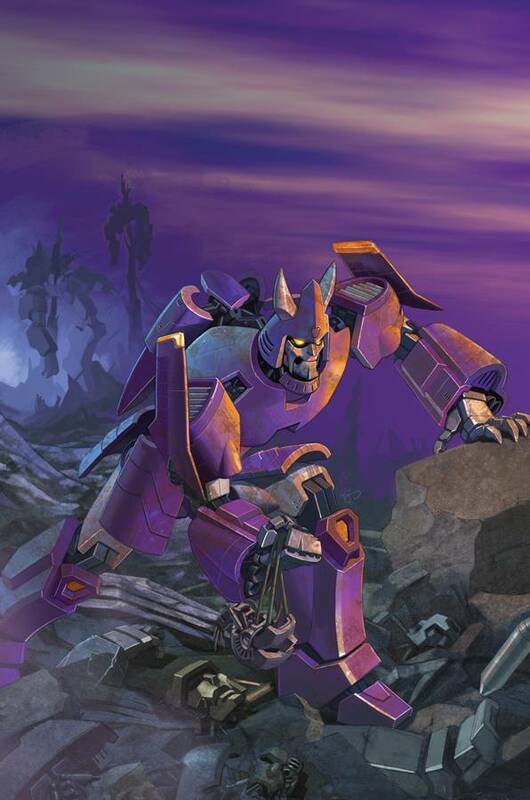 ), is Transformers Spotlight: Cyclonus, part 1 of the 4-part Revelations arc. Those of you who’ve been following the brooding, bubbling under subplot concerning Nova/Nemesis Prime and the Dead Universe are about to be hit by the raging hurricane that is Revelation. But, as well as being part 1 of 4, it’s also a Spotlight, and the character focus falls, first and foremost, on Cyclonus. But who is IDW/TF-verse Cyclonus? Given the recent IDW reinvention of Galvatron (in Spotlight Galvatron) it can’t be the animated movie version (as there’s no Unicron). This Cyclonus is, nevertheless, associated to Galvatron, inasmuch as both are/were part of the crew of the (long missing) first Ark. But who is Cyclonus and why’s he back on Cybertron (now a ruined, largely uninhabited husk)? And why exactly is he taking out his considerable frustrations on Hound’s unit (comprising Sideswipe, himself the subject of a latter Spotlight in this quartet, Warpath, Road Rocket and Skram)? And how does Ultra Magnus get drawn into the action? And what’s that stirring inside a cave on Corata-Vaz? Something BIG, something terribly familiar (especially if you’ve been following the various IDW/TF arcs of late). The Expansion (whatever THAT is) is upon us, and the storm is well and truly raging! Spotlight Cyclonus hits this Wednesday (18th) in the US and Thursday (19th) in the UK. It’s written by me with art by EJ Su. Click on the thumbnail below for a look-see at EJ’s cover, part of one huge scene specially created for this landmark four-part arc. For information on all IDW’s new releases, check out their website here. This entry was posted on Monday, June 16th, 2008 at 7:09 am and is filed under Uncategorized. You can follow any responses to this entry through the RSS 2.0 feed. You can leave a response, or trackback from your own site. Can’t wait to see this comic in-print! First off, a big tip of the hat to Kris, who did such an excellent job with the colouring on Cyclonus. And just generally, apologies for being bit absent from the feedback threads just recently. Between work, conventions and an attempt at a life, I just haven’t had any spare moments (at all!) to Q&A with people as I like to do. I’ll try and stay more on top of this in the coming weeks. Thanks to everyone who regularly or even intermittently frequents this blog. I really do appreciate and encourage the feedback! Oh, and if you’ve asked a question on another topic/thread (and not got an answer), feel free to reiterate it here and I’ll do my level best to reply this time. I missed you at the London Expo (still kicking myself over that one) but wanted to say congrats on making the current TF run so entertaining – I’m really looking forward to some Furman-esque action, complete with the usual engaging character banter. Thanks for making TF’s relevant again! 1. Does the IDWverse G1 Megs take his defeated opponents’ sparkcores as trophies? 2. Do you have some input into IDW’s TP decisions, and if so, what do you think of the idea of collecting Dreamwave’s, FunPub’s, and the OTFCC’s Beast Wars stories (“Ain’t no Rat”, “Dawn of Future’s Past”, “The Razor’s edge”) into a trade? maybe include some of Fig’s never-before-seen concept art, too, to fill it out; call it “Volume 0” or something? 3. I realize that an IDWverse OP origin story isn’t on the table, but would you say that whatver it is, it’s similar to “War Within” volume 1? 4. Will we ever get to see the Beast Era timeline summary/chronology that you and Ben Yee worked out published or posted somewhere (see question 2)? I post a mere four questions in response to Simon’s offer of a little Q&A, and you guys wipe it? No one wipes stuff ‘cept me. It’s just that some posts need my clearance before they appear in the thread. I’ll get to your questions tomorrow 1400scale. BTW, if you ever get a minute, drop by Don Murphy’s message board and say hi. All the Stooges I know love ya. I’ve been looking forward to reading it for months now. I’m sure it’ll be great. Thank Primus it’s finally here. Can’t wait to see how you wrap this up Simon, and I’m looking forward to Max Dino’s. Hey BB Shockwave, I have been following TF Animated (not every episode but a goodly number), and I’m happy to confirm that I will be writing some TF animated comic strip for Titan’s upcoming comic release. More details on that soon! 2. Do you have some input into IDW’s TP decisions, and if so, what do you think of the idea of collecting Dreamwave’s, FunPub’s, and the OTFCC’s Beast Wars stories (”Ain’t no Rat”, “Dawn of Future’s Past”, “The Razor’s edge” 😉 into a trade? maybe include some of Fig’s never-before-seen concept art, too, to fill it out; call it “Volume 0″ or something? SF) I don’t have any input into IDW’s TPB output and neither would I want to. It’s very much their call. The only place IDW did seek out my advice/suggestions was for ‘The Best of Simon Furman’ collection, naturally enough. SF) Something along those lines, yeah. He wasn’t a Prime, then he got the Matrix and he was. SF) Maybe. No plans as yet. Hmm. so the IDWverse Optimus does have a/the Matrix and it wasn’t lost along with Nova Prime into the Dead Universe. This actually settles a minor debate going on in the fandom, thank you. Damn, with “Origin” #4, “Escalation #5”, and “Spotlight Ramjet” I was so sure about the sparkcore trophy thing. I figured it had been in line with his whole gladiator past. One more question I forgot yesterday (and I understand if you pass on it): is there any chance of seeing a Beast Era story set exclusively on Cybertron, either before, during, or after the BW/BM series(s)? You’ve probably seen episode #7 – Thrill of the Hunt – then, I was surprised to read on the designer’s blog that Lockdown was not based on Death’s Head, they look quite similar, well except for the speech impediment, yes? Wait, I though Nova Prime took the Matrix into the dead universe and Optimus never got it? Or have I misunderstood something here? I never said Prime still has it! Can’t speak for Origin or Ramjet, but in Escalation #5 Meg’s intent is to crush Prime spark core. He never says he’s out to collect it. There’s definitely a chance of the one of the above options. But we’re still at the very early planning stages when it comes to more BW. The full Matrix tale will out in due course. Promise. 1. What’s the logic behind creating a new character (Grindcore) for the Dead Universe cast? Is he going to play an important role in Revelation? 2. Can we expect an update in Revelation on some of the plot threads left dangling in Devastation, like Ironhide’s status and Verity and Jimmy’s fate? 3. Is Road Rocket supposed to have been killed by Cyclonus? He gets hit by a missile in the cave and then isn’t seen anymore. Seeing as Hound’s arm was dessicated by a shot from Cyclonus, I can only imagine being hit full-on with a missile would have more serious consequences for RR. That Decepticon having an unfortunate encounter with Arcee looked kind of Sunstreaky, is there any chance he’s meant to be Pocket, Sunstreaker’s evil twin from the Go-Bots? Also, not knowing who the member of Nemesis Prime’s merry men on the far right is will bug me until the next issue, I’m sure. I’m curious about something. There’s no ramjet or mirage on Infiltration, Escalation and Devastation co can spotlights on them be considered canon or not? T-Wing: Road Rocket can be seen in the Spotlight: Sideswipe preview, rolling along merrily in his unicycle mode, I’m happy to report. 🙂 I really like that Simon is bringing in such obscure G2 characters and giving them a chance to shine. And btw, for those who don’t know – this is not Skram’s first comic apperance. He was fighting alongside Jazz, Sideswipe and Grimlock in Marvel’s UK exclusive G2 two-parter comic. T-Wing, Grindcore rounds out the Dead Universe cast because a) I really love the name and b) I didn’t just want to do the entire cast as ‘new’ versions of old characters. Grindcore doesn’t play a big part in things, though he does fight Sideswipe in Spotlight Sideswipe! As for the respective fates of Ironhide, Jimmy and Verity, sorry — no update in Revelation, just toooo much else to fit in. I promise an update as soon as I can. In the meantime, check out Nick Roche’s FAB Ironhide interlude on the IDW forums (http://forum.idwpublishing.com/viewtopic.php?t=4140). And Road Rocket’s still up and running. His pride’s hurt, though. Conor E, that Decepticon Arcee’s torturing is the one seen at her feet, dead, on the cover of Spotlight: Arcee. How’s that for interconnected? Azurek, I’m pretty sure Mirage featured in Spotlight: Blaster. But just generally, once they appear in an IDW Spotlight or ‘ongoing,’ it’s canon. Yeah. I’m loving seeing the G2 guys get their respects. As I keep saying, I’d rather see obscure never or barely used characters with toys for the small parts in storylines even if their only function is to die than I am seeing brand new characters. Even Leadfoot warrants interest from me even though he died pretty quickly whereas I just don’t care about Gizmo and the others in Hot Rod’s Spotlight. I suspect I won’t care about Grindcore either (even though we’ve only seen him in one panel so far). Sorry. But thanks for the explanation as to why Grindcore is in the comic – makes him less of a random inclusion.